384 pages | 88 B/W Illus. In this new volume it is argued that network effects are much more common than usually assumed, and that they have a profound impact on many aspects of economic systems, especially technological change and economic growth. The analysis and modelling of this interrelationship is the central focus of this book. While there exists a vast body of literature on economic growth, the theories put forward so far have had limited success in explaining observed patterns of economic growth. ‘Growth cycles’ in particular continue to elude standard economic models, though evolutionary economics has made some progress. Seeking to fill the gap, Torsten Heinrich’s innovative approach uses microeconomics to explain heterogeneous sectoral dynamics on the meso level, and then aggregating these to observed macroeconomic growth rates. In this way, it is shown that an evolutionary model of technological change with network effects can explain not only commonly observed asymmetric industry structures, monopolies and oligopolies but also ‘growth cycles’. 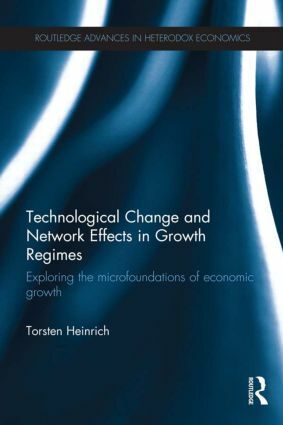 The book includes a comprehensive account of the most influential economic growth theories, a discussion of the research on network effects as well as an introduction to the methodology, the model, and a case study on the recent emergence of information and communication technology. This important new volume will be relevant to all those interested in theoretical economics, growth theory, innovation economics, agent based modelling and industry dynamics. Torsten Heinrich is Postdoctoral Lecturer and Research Assistant in the Faculty of Business Studies and Economics at the University of Bremen, Germany. Over the past two decades, the intellectual agendas of heterodox economists have taken a decidedly pluralist turn. Leading thinkers have begun to move beyond the established paradigms of Austrian, feminist, Institutional-evolutionary, Marxian, Post Keynesian, radical, social, and Sraffian economics—opening up new lines of analysis, criticism, and dialogue among dissenting schools of thought. This cross-fertilization of ideas is creating a new generation of scholarship in which novel combinations of heterodox ideas are being brought to bear on important contemporary and historical problems. Routledge Advances in Heterodox Economics aims to promote this new scholarship by publishing innovative books in heterodox economic theory, policy, philosophy, intellectual history, institutional history, and pedagogy. Syntheses or critical engagement of two or more heterodox traditions are especially encouraged.